For seven years now, Greg Amundson has stuck to a strict Zone meal plan, and the results have been great. At about 6'0", and a lean 205lbs with a very high activity level, Greg was prescribed 22 blocks and 2x fat. He has varied only occasionally from this over the years, even while serving as a full time Sheriff’s Deputy and SWAT operator in Santa Cruz County and as a 1LT in the US Army National Guard. After about three weeks in the Zone, I had a paradigm shift about my relationship to food. Suddenly, food existed in my life to serve a purpose. I did not care what the meals tasted like or what my peers thought of my Tupperware and lunch pail. I was on a mission to be the best CrossFit athlete I could be, and I knew that by eating in the Zone I would be able to optimize my results in the gym. After almost eight years of training in CrossFit and seven years of eating in the Zone, I have come to the realization that CrossFit is more than an elite fitness and conditioning program. CrossFit is a way of life. The lessons learned in the CrossFit gym, such as accountability, perseverance, dedication, and discipline, are directly applicable to life outside the gym, including the kitchen. Therefore, I find it perfectly logical that the word “diet” comes from the Greek root meaning “way of life” — and that eating in the “Zone” is a way of life that supports a healthy body. Nice article Greg. I recently have been making the move over to the Zone and this article is giving me just that much more of a reason to get it dialed. Where are you working out these days? Talking about timing. I just received my Enter the Zone book this afternoon. I'm going to read this article and then start reading my book. Thanks in advance. I have been contemplating trying the ZONE diet for a few months now.I think this article has me convinced. It's good to hear from you and sounds like you continue to do well. Your early videos were a large part of what inspired me to Crossfit and in person you're one of the nicest & most humble people I've ever met. Thanks for the Zone/Paleo testimonial, I'm drinking the kool-aid! That article was awesome. I did strict zone for a couple months and experience the same changes. I then fell of the wagon and it has been a rough road getting back on. I am good for a few days and then give in to a dinner offer or something way to easy. I have printed off your five meals and going to give it a go. I already try to eat Paleo as much as possible so I am just going to sub the pasta and oats for more fruits and veggies. I do leave for Recruiter school in a few days. Do you or does anyone else have any tips on eating well at the chow hall? I second the comment about Greg being one of the nicest, humblest people around. And it's good to know we've got beasts like him ready to show up with a sniper rifle and keep us safe! Nice article. I find articles like these inspiring and help keep me motivated. I work full time and staying in the Zone can be a challenge at times. Thanks for the receipes, ill have to try them. Just one question?, is it necessary to paint ones toe nails to become a fire breather or does it happen naturally after zoning?! In photo of Greg doing weighted pull ups his toe nails are definately painted! "Suddenly, food existed in my life to serve a purpose. I did not care what the meals tasted like or what my peers thought of my Tupperware and lunch pail." This is perhaps the key realization to success. Break the emotional attachment to specific foods and you are good to go. Loved the article Greg. You're an outstanding role model to all. When I first discovered the Crossfit website, your pictures and videos were what inspired me to start the program. Diet has always been the most difficult part of fitness for me. Once again, you have inspired me to get my diet "right". Although we have never met, I want to thank you for all your help. Great article, just what I needed to start the new year off with! Can you share the 5 day meal plans that Coach gave you to start with? You are living proof that you can maintain a 200 lb very fit body on about 22 blocks plus doubling the fat. If my math is correct that is only about 2002 calories per day which is about the same as you Basal Metabolic Rate. Do you think the BMR/Body Fat factor/Daily activity level method of determining daily calorie requirements is not valid? Do you think that in general the Zone method daily caloric intake is low relative to many conventional methods. How are you calculating the calories? Remember, there are a lot of hidden calories in eating according to the block charts. If you say a slice of bread is two blocks of carbs and only count it as 72 calories (2 blocks x 9g/block x 4cal/g), you miss the protein and fat in that slice. This is true for most foods. Furthermore, the difference in calories between 4 blocks of hamburger and 4 blocks of turkey breast is significant. Counting calories is inconsistent with eating according to block charts. The main goal of the Zone is to balance the hormonal response to food, and to create a general restriction to the overall quantity. The blocks are precise enough for us to thrive on. I am new to the "Zone." The block system appears to be great for planning. Thanks for the article Greg!! I'm moving to Korea for 2009 and move to Kuwait for 2010 so the tupperware meals will come in handy. Since reading Greg's article i've been 'zoning'. (about 8 days) Im amazed with the results, i feel full of energy, my training is going really well, i wake up fresh as a daisy in the morning and i have clarity of though and excellent concentration.my body fat is at about 8% so i think i will double the fat intake soon as i dont want to get too lean. I even bought some tupperware! Cheers greg. It is soo true that what you need for the Zone is good Tupperware. A little bit of planning before heading to work can make all the difference in a workout. Also good suggestion about running to a grocery store when out of food on the road. Just as fast as fast food and such better choices. Zone/Paleo is the way to go if you are going to succeed as a CrossFitter. Greg, nice article. I am a retire SEAL and now working to becaome a police offer. I have been doing CrossFit for a little over two years. Mostly on my own although never completely thanks to the website and the CF Journal. I learned the exercises by watch the videos and read the forums. I feel I am in as good as shape now as I was 18 years ago when I went through BUD/s. Because I am older I can't get away with eating a drinking like I used to and still be able to perform like I want to. I have been trying to Zone for a few months now. I am having a hard time getting continueing for more than a few days in a row. I excuse or lack of comes down to being lazy and not preparing my meals ahead of time and not making sure I have the proper food at the house. Your aticle and those like it help me keep trying to do a better job on the diet side. Thank you for yor sevice and be safe. 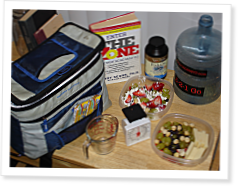 I'm pretty new to Crossfit, but can vouch that the Zone is by far the best nutrition plan. No other way of eating curbs hunger or promotes fat loss while maintaining good health. I have the hardest time with snacks, so I try to eat 3 4 block meals per day with one 1 block snack before working out. It seems to work for me but wonder if I would be doing even better by incorporating the mid-day snacks into my routine. Tupperware is great but you might also want to checkout www.happytiffin.com they have cool stainless steel lunch boxes (stackable containers) I guess you could call them. I plan on buying a couple to bring my lunches to work easier. I am new to CF, and want to get into Zone, been watching the videos and reading the journals. I know that there are a lot of the zone books by Barry Sears, but would the "Enter the Zone" be the 1st I should read for more in deepth understand? What about protein powder and such......do you, when in the Zone, use that or is it not needed at all? I know that 'The Zone' should take care, but it's an oooooold habit and they do not go away easily.